2 Hour delay for Tuesday, February 26, 2019. Mabton Schools are on a 2 Hour delay for Tuesday, February 26, 2019. Schools closed for February 14, 2019. Due to inclement weather, school has been canceled today, February 14, 2019. 2 hour late start for February 13, 2019. We are on a 2 hour late start for February 13, 2019. We will follow the normal Wednesday early release schedule. Mabton Schools are closed February 12, 2019. Las escuelas de Mabton estarán cerradas el 12 de febrero de 2019. UPDATE: The Mabton School District is CLOSED. UPDATE: The Mabton School District is CLOSED on February 5, 2019 due to weather. Enjoy this closing song from our Superintendent. Stay warm and safe, everyone! El Distrito Escolar de Mabton no tendrá clases hoy debido al tiempo. This week we are highlighting Litzy Velasco. Litzy is a full time running start student taking AP Calculus at MHS. 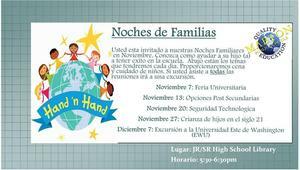 You are invited to attend our Family Nights in November. 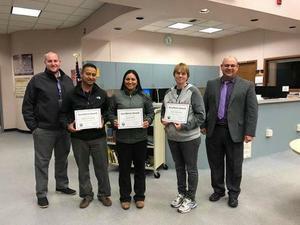 Tonight, we are excited to recognize four very special educators.